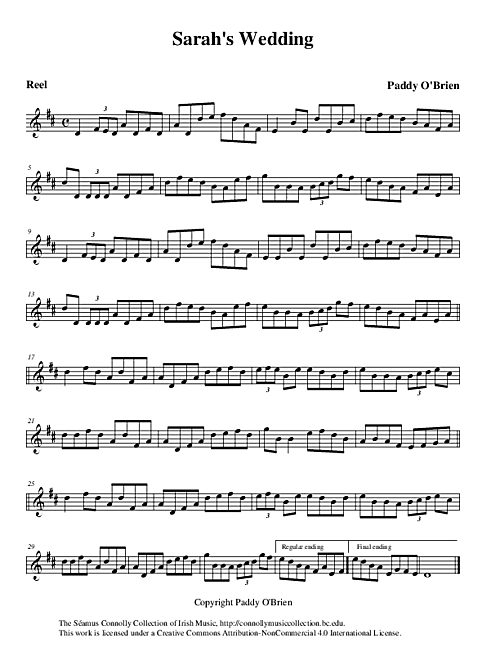 Paddy O'Brien from County Offaly made this tune for Sarah Kelly, the daughter of his friend and musical cohort, fiddle player James Kelly. All who attended Sarah's wedding had a wonderful day. Paddy, in his own unique style, performs it on this track. O'Brien, Paddy (accordion) (composer), “Sarah's Wedding,” The Séamus Connolly Collection of Irish Music, accessed April 20, 2019, https://connollymusiccollection.bc.edu/document/621.